Whether you are trying to pay off some debt, are working towards homeownership or retirement, or are worried about your ability to meet your financial obligations, it is very important to take the time to educate yourself about the options available. There are a lot of good options available, and each one can sound very appealing, but they also can have short-term and long-term consequences that you should be aware of. The premise of debt settlement is that you might be able to pay off your unsecured debt (credit card debt; utility bills; medical debt) for less than you owe. Debt settlement has tremendous appeal on the surface with the promise of paying as little as half of the principal amount owed on the debt. Some debt settlement companies (also known as “debt relief” or “debt adjusting” companies) may be successful at reducing your debt, but you should be aware that their services and programs also come with risks that could leave you deeper in debt. First, there is no guarantee that debt settlement companies will be able to reach a settlement agreement with your creditors. Accounts considered for settlement must typically be 3-4 months delinquent before creditors consider negotiating. During that time, late and over-limit fees, as well as interest, continue to be added to your balance. Let’s assume that you initially owed $5,000 when negotiations began, and you were hoping that the creditor would settle for $2,500, the amount owed could be much higher by the time an agreement is reached. Debt settlement can also be expensive. Reputable debt settlement companies can’t collect a fee until they’ve reached a settlement agreement, you’ve agreed to the settlement, and you’ve made at least one payment to the creditor or debt collector as a result of the agreement. Having said that, as soon as the company reached an agreement on one debt, it can start charging you that same proportion of its total fee. For example, if your total debts came to $10,000, and a debt relief company settled $5,000 of the total amount, it’s allowed to charge 50% of the total agreed-upon fee. Debt settlement can have a negative impact on your credit. A debt settlement company will typically encourage you to stop making payments on your debts while you save up money for a lump-sum payment. But at this point, your creditors might not have agreed to anything, which means all those payments you’re missing can wind up as delinquent accounts on your credit reports. It is also possible that the creditors will eventually send your account to collections or sue you over the debt. Settlements could also impact your tax return as the IRS may count the amount forgiven as income. For over 50 years, accredited nonprofit consumer credit counseling service agencies (CCCS) have been offering a different type of service called a Debt Management Plan, which allows them to structure payment plans with creditors and to stop late fees or collection efforts. A Debt Management Plan (DMP) is a voluntary agreement that establishes a repayment schedule allowing you to typically repay your full balance to your creditors within 2 to 5 years. Once set up, the DMP allows you to make a single monthly payment to a consumer credit counseling agency such as Consumer Credit Counseling Service of Maryland and Delaware, Inc. (CCCSMD). In turn, the counseling agency disburses your monthly payments to the creditors that have agreed to the DMP. Creditors are usually receptive to working with you as long as consistent payments are made on a thirty- day cycle. While on a DMP, you still receive your creditor statements. The plan allows for 1) paying off unsecured debt included in the plan within 5 years or less, 2) reduced interest and fees, 3) one monthly payment, 4) personalized support, and 5) may assist in building or rebuilding your credit if consistent payments are made. Individual financial education and support are key to the long term success of a DMP and reputable agencies such as CCCSMD take a holistic approach, providing financial counseling and education to explore repayment options that will help you achieve your financial goals. While on a DMP, you have to agree to refrain from using credit (except in the case of an emergency). Make sure to do some research before selecting an agency to work with. There are some for-profit companies that offer a similar service and who charge large fees for these services; however, nonprofit agencies such as CCCSMD only charge nominal, state-regulated fees and provide services regardless of an individual’s ability to pay. 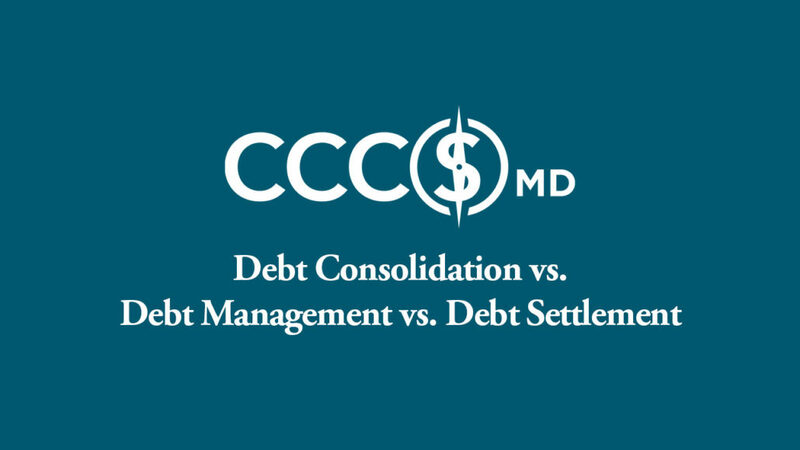 Debt consolidation entails taking out one loan to pay off others and can take many forms, from obtaining a loan from a financial institution to payoff other creditors, transferring credit card balances to a zero or low-interest card, accessing funds through a 401K, or using a home equity product. Unsecured debt such as credit card balances, medical bills, or personal loans are rolled into one account and a single monthly payment instead of multiple. Transferring balances to another credit card typically comes at a price; sometimes as much as 3% of the amount transferred. The zero or low rate new card may be for a limited time and, if you miss a payment, the rates can increase dramatically. Withdrawing retirement funds (such as from 401K) early can result in paying taxes on the withdrawal and a 10% penalty fee. Home equity loans or lines of credit reduce the amount of equity you have available for other possible uses such as high-cost reports. Adding additional liens against your home can make it more difficult to sell your home if its value is close to the amount you owe on your mortgage and any lines of credit. Debt consolidation can be a viable option if you have good credit and can qualify for more desirable interest rates that can result in lower overall repayment costs. One of the most common concerns with debt consolidation is the likelihood that you will be tempted to continue to use the credit cards that were paid off through the debt consolidation, resulting in increased debt levels. Bankruptcy is a very personal choice that needs to be considered very carefully. There are two types of bankruptcy: Chapter 7 and Chapter 13. A Chapter 7 wipes out all qualifying debt to allow for a “fresh start”; but the trustee, who is an individual appointed by the court (but not an employee of the court) to oversee your bankruptcy, can sell your non-essential property (also referred to as nonexempt property; what is classified as such varies by state). There are no monthly payments on the qualifying debt, but certain debts typically cannot be included such as 1) child and spousal support, 2) income taxes incurred in the last three years, 3) some pending legal awards, and 4) student loans (unless there are extreme circumstances where there is proven repayment hardship). Chapter 7 is not an option for everyone; if you have enough disposable income to sustain a Chapter 13 repayment plan, a Chapter 7 won’t be possible. A Chapter 13 is a reorganization of debt that allows you to keep all your property. The reorganization requires you to pay creditors the value of your nonexempt property as part of the three to five your payment plan through the bankruptcy. The payment plan, also referred to as wage earner bankruptcy, is based off of 1) how much you owe, 2) value of your nonexempt property, and 3) how much income you earn. Chapter 13 is often a strategy used to prevent foreclosure, stop collection activity, or avoid repossession. Bankruptcy can offer immediate relief; however, it may have a long-term, negative impact on accessing affordable credit options. It also remains on your credit report for up to 10 years. You may receive several tempting credit card offers; but they will likely have higher than normal interest rates. CCCSMD can help you navigate through the different options available. We’ll start by discussing your financial goals, review your entire financial picture – including your budget and credit report – and will brainstorm with you on the best options for you. For immediate assistance, call us at 1-800-642-2227 or contact us online to speak with one of our certified Financial Advocates.